Fibro fog manifests itself in different ways, including forgetfulness, difficulty remembering names or where you place an object. This year’s theme “Helping yourself…while helping others” reminds us that you feel better when you help others living with FMS. I didn’t choose a life with fibromyalgia, it chose me. Many days I wish I was my old self, pain-free and full of energy. Yet, until a cure is found, this me has been the norm for close to 20 years now. I have learned to cope and live, and even thrive. And so I want to share my top 10 lessons from life as a fibro warrior. 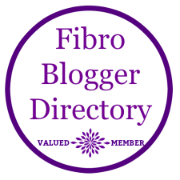 Help fight your fibro-fog! Yoga improves your mind’s ability to process information. The thought of exercising when you are in the throes of pain and fatigue may seem counterintuitive, but that’s exactly why you should get moving. Research shows that regular exercise can reduce pain and improve overall health. There are additional benefits for fibro sufferers. But too strenuous of an exercise can certainly trigger a flare and set you into that vicious cycle of pain and fatigue, leaving you with no energy for working out. If this sounds like you, consider the practice of yoga to help ease the symptoms of fibromyalgia.